Fashion is all about style and wearing the perfect footwear to go with it. Have you heard of White Mountain Shoes? Well let me tell you about them. They have so many styles from sandals clogs & mules heels & wedges flats, oxfords & moccasins luxury leathers boots. Their prices are low and reasonable. White Mountain Shoes will make you look good for any season. After going around browsing White Mountain Shoes website. 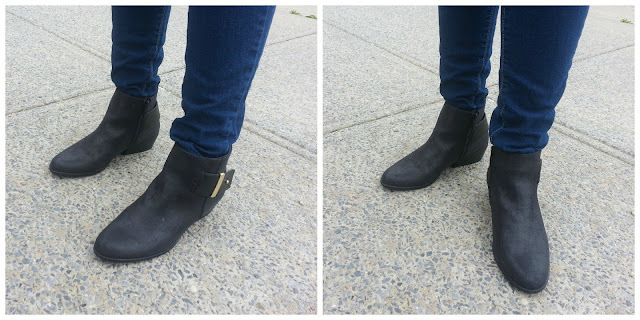 I've got the perfect booties for on-the-go and looks so fabulous. I want to introduce you to their Limerick Black Fabric Bootie. I've matched up the limerick black fabric bootie with a sleeveless blue top, tight blue jeans and leather jacket. I have gotten compliments wearing the booties. The booties are easy to slip-on or off. I wear a size 9 and fits perfect! The buckle gives it style and perfect for any season. They look good with any piece set of clothing. I've used them with a few items and very pleased with them. My favorite booties for Spring. It's the perfect 2 inches heel height, rubber soles and their comfortable! The limerick black fabric bootie is nicely stitched. It's low in price and made to last. The booties are available in color black, bronze, silver and retails for $42.44. They look good worn with any top, jeans, tights, shorts and skirt. These booties are a great buy. White Mountain Shoes will make you look good everyday! Fashion is just taking your steps to new shoes. To find out more about their limerick black fabric bootie or buy one visit www.whitemountainshoes.com. Connect with White Mountain Shoes for new products, offers and more on Facebook, Twitter and Instagram. This seems to be a good buy. I usually don’t mind the price tag as long as the product is durable. It’s been half a year since I last bought my shoes so I’d keep this in mind. I love those booties and so happy that it will be boot season soon. They look very comfortable and versatile. I can definitely see them dressed up or dressed down. I have recently fallen in love with booties! That name is hard for me to get used to, though! It reminds me of kids shoes. :) Anyway, I really like these and I love that you can easily slip them on and off. No one wants to fuss to get their shoes on! Cannot believe that it is time to start thinking about boot weather already. Dont get me wrong I LOVE BOOT weather! but this summer went so fast. I love these boots you have. I had a similar pair of boots and I wore them out. I can't wait to get my hands on another pair, but I haven't been able to find them locally. Did I mention that I love black? So that will be my color choice. I really like those shoes! I have been meaning to grab a few new pairs and now I'm inspired to do just that. Will have to add this to my fall collection. Those shoes are super cute. They kinda remind me of those shoes Paula Abdul would wear. She was one of my favorite singers growing up and I would always try to buy shoes that looked like hers. I am the queen of booties! I love them! It's the one shoe I have the most of...even more than heels! These ones are really cute too! Those are great looking shoes, and man for under $50, how can you go wrong! Do you know if they sell them in DSW or other shoe stores, or just direct from their website? Mike Howard DSW doesn't have the Limerick Black Fabric Bootie featured here. DSW does carry other White Mountain sandals and boots. Go on Google search and find they sell the Limerick Black Fabric Bootie in other websites. You can also visit White Mountain and buy the booties from them. If anything else let me know.